Imogen and her mother Bethea are escaping the clutches of the Banshee – a terrifying supernatural predator. While escaping they come across an abandoned house and take shelter – only for the monster to invade and take Bethea away. Imogen sets out in search of her mother; traversing the eerie forest and escaping the horrifying monster. But to save her mother and defeat the creature Imogen will have to go further than she ever thought possible. Banshee is a story about family and fear. The feelings that hold us down and forces that oppress us, and how family and love can surpass even the most terrible of circumstances. Our project is not only a frightening and intense horror film but a subversive one. Casting both the hero and monster as women is an unfortunate rarity in the genre. Our emphasis is on balancing the terror of the horror elements with a moving and compelling story about family and sacrifice. However our project is incredibly ambitious, and we’ll need your help in order to make it a reality. We are a team of final year BSc Film and Television Production Students. In October this year we embarked on this ambitious project and by April it will be complete. 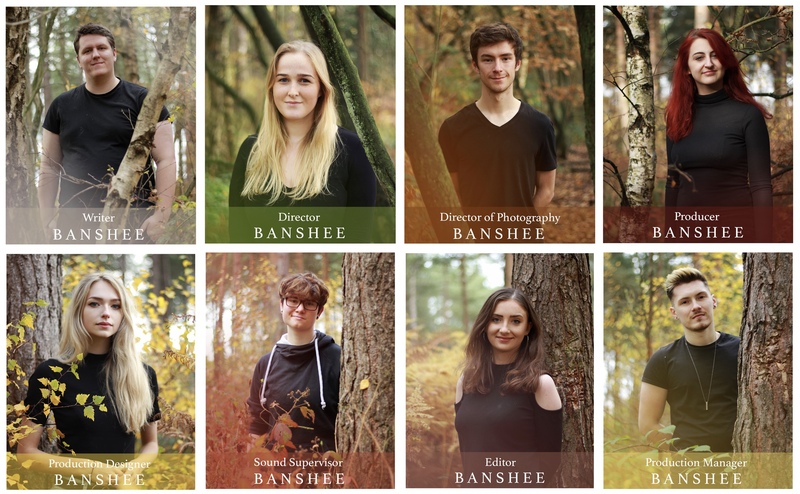 Between us we have experience in dozens of short films as well as professional productions and we firmly believe that Banshee will be the apex of our careers thus far, but your kind donations are a key part of making this happen. We’re shooting the film in Allerthorpe woods in East-Riding of Yorkshire – a beautiful and potentially haunting place. Furthermore, we will also be needing a dilapidated house for the home invasion sequence. Your money will go towards securing these locations and making them a hospitable environment for our 6 day shoot – without them we have no film. Although our team is based in York we will still need to book transport for ourselves and our extensive equipment. Many donations will go towards supporting our cast members; covering their travel, accommodation, and expenses. Our actresses are incredibly important to us and we want to ensure their comfort, so it’s essential for us to reach out target. Food and drink are essential on a film set and ours is no exception. Our shoot is more strenuous than most so it’s imperative that our team has as much support as possible. Perhaps the most visceral result of your generous donations is the expansive production design of the film. The forest and dilapidated house will require extensive modelling and careful adjustment. Each character will have their own wardrobe and extensive makeup. Perhaps the greatest example is the Banshee herself – needing extensive costume design, full body paint and detailed prosthetics to create her monstrous visage. Our shoot will be technically complex and requires more equipment on top of the kit that we have already secured in order to safely navigate the forest while getting beautiful shots. In case of emergency or unforeseen complications. Youtube - Instagram - Facebook. ... And of course here on YuStart we'll be posting regular updates! It is only with your help that we can make this project. All donations are welcome, and we are so thankful for anything you can gift! This project would be impossible without your help. As well as donations we are immensely thankful for sharing our project on Facebook, Instagram, Twitter or to anyone who might be interested. Thank you very much for your donation! In exchange for this, you will receive a public thank you on all of our platforms. Your £10 can go towards: • Thermal wear for three cast and crew members. • Almost a full bucket of liquid latex to create the Banshee’s horrifying face. • Three packs of face and body paint to create the Banshee’s horrifying face for the whole shoot. Thank you very much for your donation! In exchange for this, your name will be in the credits under special thanks, and the previous reward. Your £25 could go towards: • 2 buckets of liquid latex to create the Banshee’s face via SFX. • Thermal wear for eight cast and crew members. • A meal for all sixteen cast and crew member. • Two tarps to protect us from the cold weather. Thank you very much for your donation! In exchange for this, you will receive a signed postcard along with the previous rewards. Your £35 can go towards: •A complete bucket of liquid latex AND polymer clay! • Thermal wear for ten cast and crew members. • Covering location fees for 2 days. • A fog machine to create beautiful shots with. •A camping stove to warm our food and drinks. Pledge £50 or more Thank you very much for your donation! In exchange for this, you will receive a ‘Banshee’ poster along with the previous rewards. Your £50 can go towards: •A camping stove and kettle. • Costumes for our cast. •A cooler to keep our food and drinks fresh on set. • Covering location fees for 4 days. Thank you very much for your donation! In exchange for this, you will receive a digital copy of the film along with the previous rewards. Your £75 can go towards: • A full bucket of liquid latex or polymer clay to create the Banshee’s face via SFX. • Thermal wear for eight cast and crew members. • Two meals for all sixteen cast and crew members. • Purchasing a camp stove, kettle and pan for warm food and heat on set. • Funding our search for props. • Renting a portaloo for 4 days. Thank you very much for your donation! In exchange for this, you will receive a copy of the script and concept artwork along with the previous Rewards. Your £80 can go towards: • Thermal wear for the whole cast and crew! • 5+ meals for all cast and crew members. • Covering location fees for a week. • Purchasing the Banshee’s wedding dress. • Renting a trolley to transports our equipment safely through the forest. Thank you very much for your generous donation! In exchange for this, you will receive the Complete Creators Package; this includes a physical copy of the film and soundtrack, along with the previous rewards. Your £150 can go towards: • Renting a van for a week. • Renting a generator for a week to power our production. • Feeding the cast and crew 2 meals a day for a week. • Purchasing a portable heater. • Funding festival admission prices. Thank you very much! This amount of money sincerely helps our project move forward. In exchange for your generosity, you will receive our protagonist’s Red Vintage Ferguson player and the Complete Creator Package. Your donation can go towards: • Covering the majority of our insurance fees. • All the costumes for our characters. • Accommodating our talent. • Feeding our cast and crew us for the week AND cover the cost of our thermal wear! • Renting a portaloo (all the women on set thank you! ).